Looking back, I think it’s fair to say that my Father was a little obsessive over the walls in his home. During my teens we lived in an apartment in Mississauga for three years. I know for a fact that those walls were as sparkling clean when we moved out as they were on the day that we moved in. Even the superintendent expressed his amazement as he performed his final inspection on the apartment. If Father ever found any impediment, mark, smudge, or nick on a wall it would be immediately addressed and corrected. Touching the walls was strictly verboten. My husband, daughter and I are paying my Grandparents a visit. They own a pretty little condo in Toronto where they live on the seventh floor. At one point my Grandmother calls me over to her sliding patio door that leads to her balcony. Pulling back the curtain she points to a patch of glass about a foot below the lock. Seeing nothing, I shake my head no. She then tells me to look closer. All at once, I see the faint smudges on the glass that she is referring to. Although they’re not immediately noticeable, it looks like something has been smeared on the glass. Whatever it is, has now hardened and dried. Jennifer is my three year old daughter, and my Grandmother is her Great-Grandmother. Of course I remembered. Jennifer loved cheese slices. My Grandmother joyfully indulged her Great Granddaughter by plying her with cheese slices from the moment she walked through the door. For virtually the whole visit, Jennifer’s fingers were covered in orange goo. I have memories of constantly chasing her around the apartment trying to keep her hands as clean as possible with a warm soapy washcloth. Trying to keep her from touching anything was impossible. “Okay,” I nodded as I continued to listen. From the look on her face I could tell that it must have been a very proud moment for her. As I looked at her beautiful smile, the impossible happened. Your heart always finds ways to love them even more. A friend and I were swapping family stories at work last night as we sorted mail bundles. I told him a funny story about my Father, and then he told me a funny story about his Mother. The story my friend told me, was about the time his Mother had asked him to deliver a bag of Swiss Chard to a friend of hers while on his way to school. She had just picked it from her garden, and had promised it to her friend, who lived along the way. Later on, as he came home from school, he realized that he had accidentally thrown the bag into a garbage bin. He had not remembered that it was the bag that held the Swiss Chard. When his Mother found out about it, she was of course, unhappy. She had to place an embarrassing phone call to her friend to explain that her son had accidentally thrown her swiss chard away. “She never let me forget about it,” he said to me, rolling his eyes as he finished his story. I quickly agreed with him. Indeed, there were many things I had done which my parents never let me forget either. As a child and even as an adult, both my parents loved to reminisce about the embarrassing moments in my life, that I tried so hard to forget. Again and again, my misdemeanours were raised during conversations. There were many times that I had to bite my tongue, while they laughed and teased me about them. These stories made me want to crawl under countless tables. Now, both my parents have emanated into another dimension. Oddly enough, in their absence, these stories have now become my friends. Those unhappy memories that I spent my whole life trying to forget, have transformed into stories which bring me joy! It brings me even greater joy to share them. “Oh, were you sitting here?” she asked me when I returned to my chair to find a co-worker sitting in it. I had been sorting mail when I had to get up to dispatch some full containers. My seat was vacant when she arrived in the area, and so she sat down in my empty chair and began to sort. “No, it’s okay really, …stay there,” I told her. “I’ll keep busy by helping to collect mail bundles until lunch. My co-worker’s demeanour suddenly became serious. I was the resident union shop steward. I could be called any minute to defend a co-worker, explain contractual language, or smooth over misunderstandings, or worse. It was a question that I had not expected. The look on her face told me that she wanted an honest answer, and so I gave her one. She was listening intently, saying nothing. Now, it isn’t often that I put all my cards on the table like that, but I sensed that this was an appropriate time to do so. 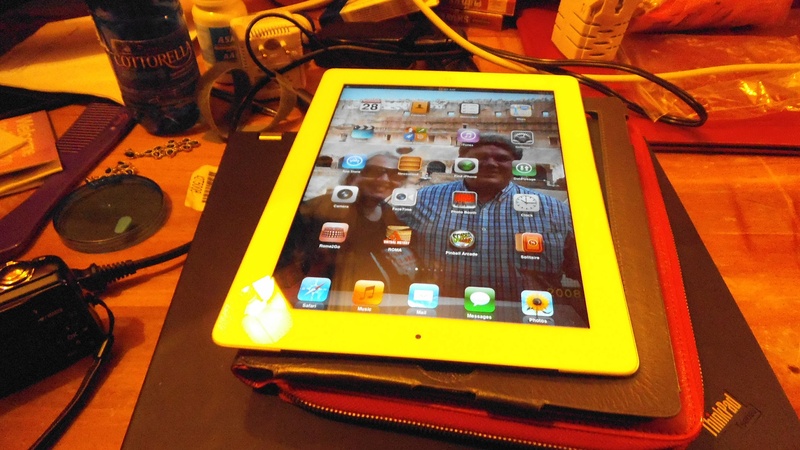 My co-worker had often shared with me the issues that she continues to struggle with. Indeed, we all struggle from time to time. Some of us struggle more than others. At the moment, I had the sense that she trusted me and that I had her full attention. With that, her face brightened. By the look in her eye, I could tell that she was. Indeed, I had been there for her on some her darker days. As for the times when life is not good, what’s important to me is being able to recognize and acknowledge to myself the times when I’m having a rough day. Then accept it for exactly what it is. If it’s good, I enjoy it now. …because that’s how I roll. “What a lovely charm bracelet,” my coworker said to me at work one day. It was a pretty bracelet. I had bought it in Italy for only five euros. The reason it had caught my eye was because of the multitude of silver dangling ‘doggie-bone’ charms. Consisting of pretty blue beads made of Marino glass and silver beads it was big and bold. What I liked best about the bracelet was that it looked fun, and the dog bone charms would make for excellent conversation starters. “You know my sister had a charm bracelet,” he continued. Stopping what I was doing, I gave him my full attention. “Yes, it was way back when we were still quite young,” he said as he continued to admire my bracelet. “That’s pretty incredible,” I told him. “Yes, for years she racked her brain, but she just couldn’t remember who gave it to her. “What did the charm look like?” I asked intrigued. “It was a lovely rose coloured heart shaped charm,” he said. “What were the two words?” I asked him. We were in the early planning stages of our impending trip to Italy when Frank first mentioned that he wanted to take a day trip to visit Tivoli Gardens. “What is the point in seeing gardens in the winter when everything will be dead?” I asked him. I envisioned barren trees and shrubs devoid of life. Empty gardens filled with dried fallen leaves. He gave me the courtesy of thinking it over for a day. However, in the end, he remained adamant. Further, he not only wanted to visit Tivoli Gardens, but Emperor Hadrian’s Villa as well. They were both featured on a half day trip. I agreed and resigned myself to this four hour day trip. At least the whole day won’t be wasted. Looking back now, I was never more wrong in my life. The time we spent at Hadrien’s Villa and Tivoli Gardens were the most magical moments of our whole trip. …..I didn’t want to leave! 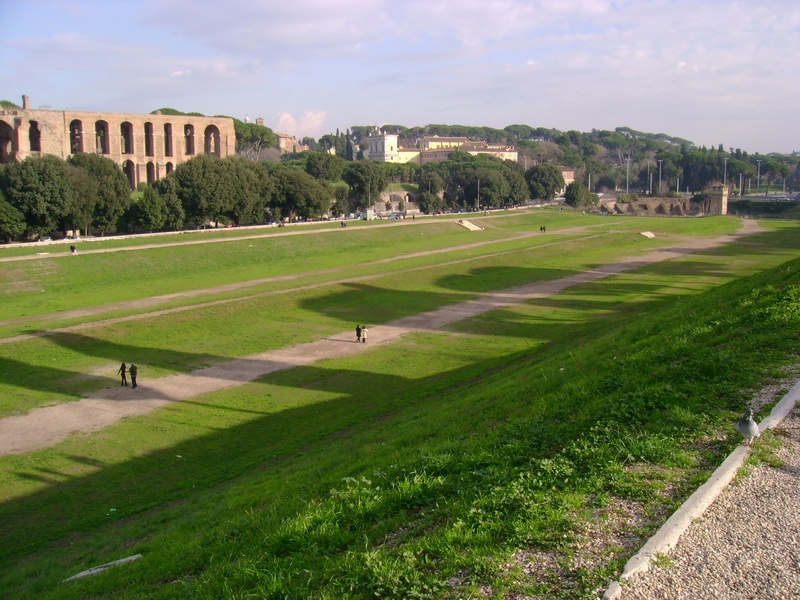 At first glance, the great Circus Maximus looks like a plain open field, and quite ordinary. 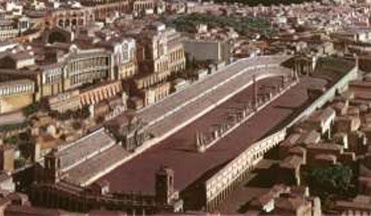 The well known chariot racing ground. I remember it best from the movie Ben Hur… that’s the way that I see it in my mind’s eye. It was a holiday tradition, every Easter for our family to watch Ben Hurr. But that was so very long ago. Unfortunately, it was quite cold outside when we visited Circus Maximus. that’s probably why there are very few people milling around this rutted out field which is actually larger than I imagined it. Now, it is a great green field in the middle of a bustling city, people bring their dogs here for a romp. Indeed, we must have seen at least six pet owners walking one, two, even three dogs. As they cross paths the pooches exchange sniffs, make friends then proceed to play. It seems a really nice way to meet new people. Besides that, I love the wide open space of it all. It’s a nice getaway from the never ending calvacade of motorcars and Vespas. The air is cleaner, and fresher without the toxic exhaust fumes that cannot be escaped. The narrow streets are always choked with fumes from the motor vehicles. Currently, Jen and I are both bundled in warm black fleece jackets and buried under cowls. Frank is proving to be quite the contrast by stoically refusing to wear a jacket. Looking back, perhaps he did that to make the experience more real. You must really love Rome.